Nice Games is proud to present 3D Pacman, a total remake of the No.1 arcade PacMan that has won the hearts and minds of millions of players from all over the world. Only 3D Pacman offers such a powerful mix of action, adventure and collection while preserving the original arcade spirit of the old good PacMan. In addition to collecting bonuses and monsters in the Classic PacMan-style mode, players now can select the Story mode and immerse into a story of bravery and devotion that was never told before. 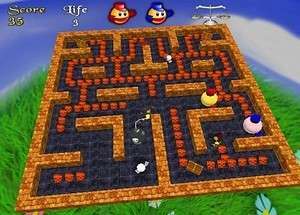 3D Pacman 1.5 is a shareware program and can be used as a demo to try the software until the free trial period has ended. A full version of the program is available after the trial period ends. For security reasons, you should also check out the 3D Pacman download at LO4D.com which includes virus and malware tests. Additional screenshots of this application download may be available, too. 4.63 out of 5 based on 16 ratings. 3D Pacman has a presence on social networks. 3D Pacman download been highly rated by our users.